The successful family office includes a marketing agency, entertainment firm, and multiple fashion and beauty lines–and continues to thrive. It may be doom-and-gloom for some retailers and brands, but True Family Enterprises isn’t feeling the pinch. The California-based family firm includes a marketing agency, entertainment firm, beauty line, and jewelry collection – to name a few businesses within its current portfolio. And while many retailers are shuttering heaps of physical locations, True Family Enterprises has remained a step ahead – mainly due to its holistic vision for its entire market presence. Heightening brand disloyalty and the rising frugality of Millennials has necessitated thoughtful marketing campaigns and purposeful business operations be informed by deep analytics curated from predict analytics. Those struggling would be wise to look to True Family Enterprises, which has not only maintained, but grown its businesses in this otherwise unstable retail landscape. For Twila True, who co-founded the office with husband and Chief Executive Officer, Alan True, remaining in the present becomes tomorrow’s problem. With that, the couple maintains a forward-thinking approach to all of the businesses within the portfolio. 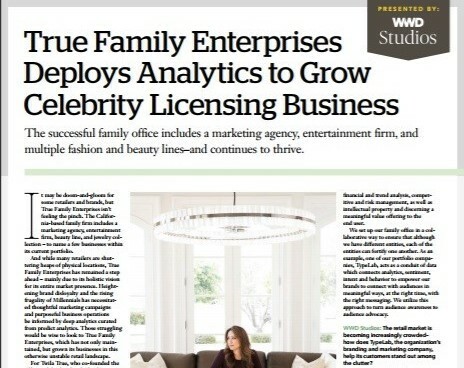 In order to systematically and strategically grow, Twila True named its branding agency, TypeLab as an integral player in True Family Enterprises’ other endeavors, especially their entertainment firm, Volume Ventures and fashion and beauty lines, Twila True Beauty and Polished Perfect by Twila True. 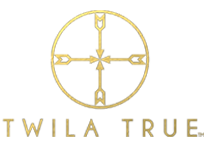 Encapsulating its various branches, True Family Enterprises has tapped its various extensions to devise organic and winning celebrity licenses for its jewelry lines. In order to ensure that each partnership is as authentic and deliberate as possible, True said that deploying data collection and analysis to predict, track, and optimize partnerships is a critical component of True Family Enterprises’ overall, ongoing success. Here, Twila True discusses the core values of the privately-owned family office, its holistic method that ensures success, and the role of technology in each of their portfolio’s endeavors.